We can help you... Experience it! 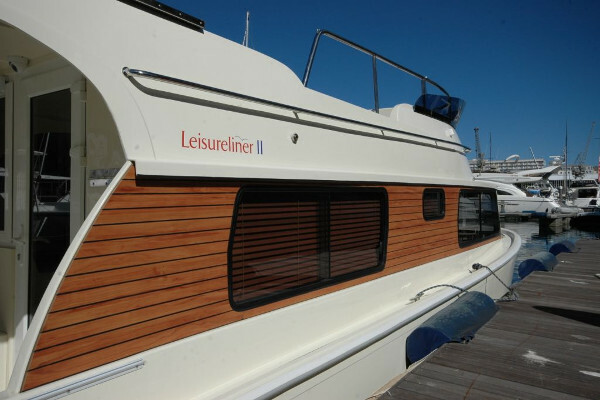 It’s easier than you may think to experience our newly updated version of this popular houseboat / inland waterway cruiser. Noticeably roomier interior, 6 Berth charter version, an up-rated “Owners” version, vastly improved bathroom area offering full privacy, more storage space and good privacy between cabins. We’ve made the design to EU Cat D requirements which means more seaworthy, more protected and more capable. We’ve also foam-filled the hull and added dual engine capability. The most striking change is the new “fly-bridge” complete with steering position and seating / sunbathing areas. This increases living area dramatically and improves steering visibility. More room, more storage, more roof and higher sides make for a protected and comfortable area in which to relax. Easy access to cabin, swim platform and fly-bridge make for great flow. We’ve added some little touches and some big ones and taken the Leisureliner 1980’s design into the 21st Century. Immediately get that feeling of extra space when climbing aboard. Relax in the larger cockpit or step up to the fly-bridge for the perfect view when steering. Experience that extra sea-worthiness when crossing the tide and feel safe. Choose from practical to luxury finishes.